In the midst of scandal, controversy and uncertainty at the Capitol here in Richmond this week, the General Assembly continued to forge ahead with its work on amendments to the state’s two-year budget and on hundreds of bills. Meanwhile, the pro-life movement continues to gain momentum after the defeat of extreme abortion legislation. Here’s a look at some of our activities this week. Commonwealth for Life rally: This week has been energizing for the pro-life movement in Virginia. 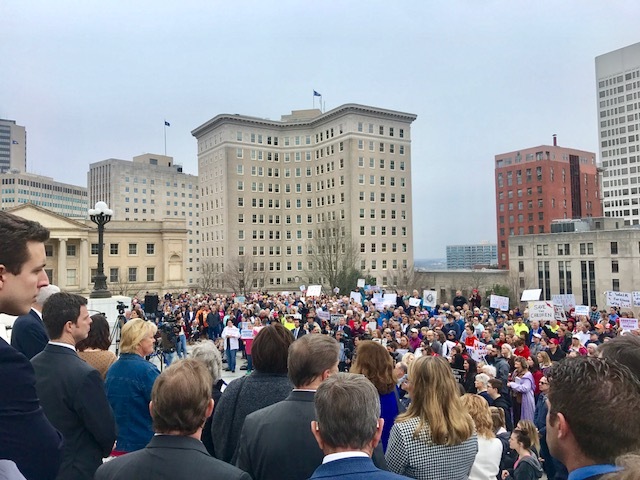 We had almost a thousand come to Capitol Square yesterday to witness to the truth, by opposing abortion and advocating for life. Thank you to all who came to Richmond. There were a number of powerful speakers, including Senators Chase, Stanley, Black and Reeves, as well as Delegate Freitas, all committing their continued support for the pro-life movement. There will be another opportunity to rally for life on April 3, as we collaborate with the National March for Life and Virginia pro-life partners to host the first annual Virginia March for Life! It is imperative that we continue to make our voices heard by our elected officials in Virginia, telling them that we are here to stay in support of those who don’t have a voice. Pro-life budget amendments: Yesterday the House approved two key pro-life amendments to the budget. In a 51-48 vote, the House adopted Hyde Amendment language, to restrict state abortion funding to the fullest extent allowed by federal law. In a 55-44 vote, the House also adopted language to prohibit the state Department of Health from contracting with or providing grants to entities that perform abortions on demand (such as Planned Parenthood), and to divert public funds away from the abortion industry toward community health centers that provide primary care. The Senate did not adopt these amendments, so stay tuned for alerts as the budget heads to conference committee! Parental consent for family life education: On Monday, the House passed (50-48) a critical bill for parental rights (HB 2570, LaRock). The legislation would require parental consent to enroll children in public school Family Life Education programs. Currently, parents only have the ability to opt out their children, but the opt-out process can be burdensome and does not always work. The ever-evolving FLE curriculum made headlines last year in Albemarle County after an explicit video was shown to 14-year-old girls without their parents’ knowledge. The bill will be considered by the Senate Education and Health Committee next week. Those of you in committee members’ districts received an alert earlier today. If you received this alert please take action! Expanding surrogacy beyond genetics: On Tuesday, the House voted 61-36 to pass a bill that redefines parentage and labels embryos as property. HB 1979 (Sullivan) would sever parenthood from biology and genetics. Even more troubling, HB 1979 refers to embryonic children as being “owned by an intended parent,” thereby denying the intrinsic dignity that all human beings possess. This dangerous bill will be considered by the Senate Courts of Justice Committee next week. Those of you in committee members’ districts received an alert earlier today. If you received this alert please take action! Virginia Vespers just days away! Please join us for Vespers, led by our bishops, on Tuesday, February 12!